It's the great debate. 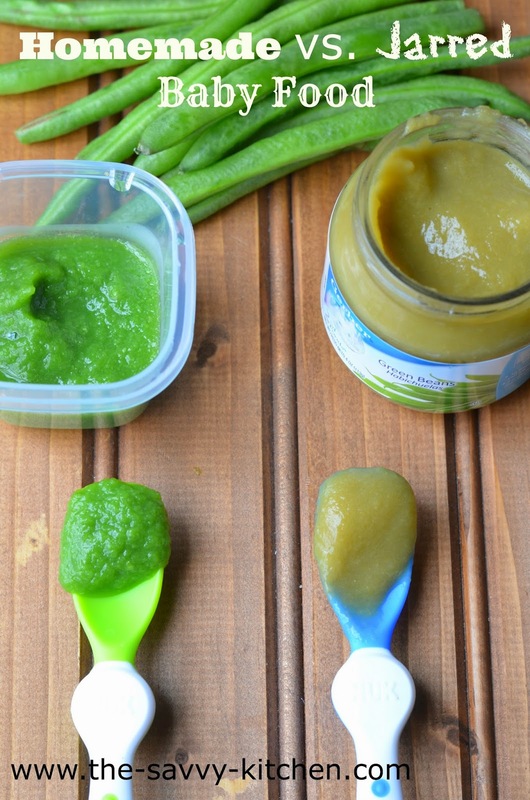 Homemade baby food vs. jarred baby food. I need to preface this post a little bit first. I'm in no way judging you if you give your baby store-bought jarred food. 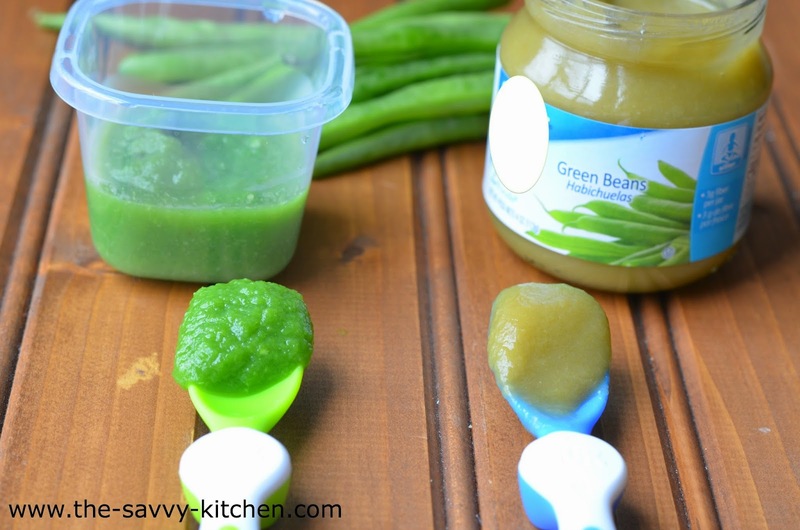 I know not everyone has the time or energy to make their own baby food, and that's okay. 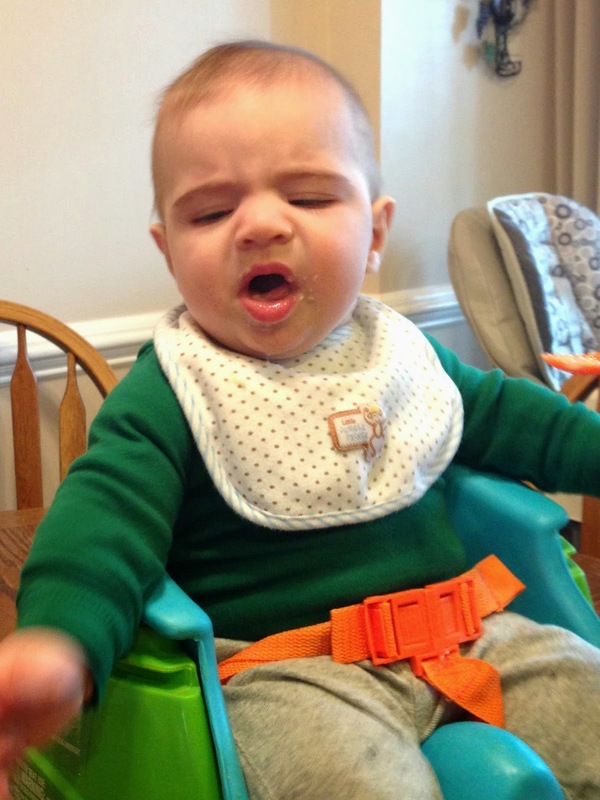 But I still want to share my reasoning behind my avoidance of jarred baby food. There are five factors that made me come to this conclusion, and I'll explain them below. In my "experiment," I compared homemade green beans to a jar of green beans from my local grocery store. Now I'm no scientist, but if these canned foods claim that the only ingredients are the fruit/vegetable and water in them, why is the color so off? I opened the jar of green beans and they seriously looked gray. I was aghast. Especially when I put the jar up against my homemade green beans, they were so off-putting. Nothing at all looked natural about the color. Green beans are bright green, so why is the stuff in the jar gray-ish? I didn't even want to touch the jarred food, why should I make my poor little baby eat it? Chris came home from work one day and was blindsided. I asked him to close his eyes and trust me. Luckily I have a very brave husband. Then he said it tasted like *ahem* dog poop. Awesome. When I asked him to guess what it was, he didn't even have an answer for me. That's how off they were. I then gave him the homemade green beans, and he immediately knew what they were. One of my best friends and her boyfriend came over the next day, and I had them do the same thing (do I have very trusting people in my life or what?). They had the same exact response to the jarred and homemade green beans. Not that Bradley knows the difference, but why should he eat something so gross that tastes nothing like the real thing? Especially if his own parents won't even eat it? There's no good reason. With homemade food, I also like that I can mix combinations on my own. I don't have to rely on what the manufacturer thinks will work together. If I want to give Bradley apples, carrots, oatmeal and pears, I have the freedom to do it! There are no restrictions. Plus, I (obviously) cook dinner very often, so I think by eating homemade baby food early on, it will get Bradley used to eating the same foods as Chris and me down the road. 3) How on earth do they stay good on the shelf for so long? Again, I'm no scientist, but this makes absolutely no sense to me. The ingredients only state the fruit/vegetable and water. So why is my homemade version only good in the fridge for 3-5 days, but these jarred foods can sit on a shelf, at room temperature, for 2 years? How does that make sense? Something else has to be in there preserving them, right? Yet I don't see anything listed in the ingredients. I personally just don't find that very natural. If I make something, I let it sit in the fridge for 3-5 days, depending on what it is, then I toss it. Same with Bradley's homemade food. But the label on the jarred green beans, which I bought right before testing them out, says they're good until January 2016. 2016!! That's more than a year and a half away! Unbelievable. I know I'm a stay-at-home mom and everyone thinks I have all the time in the world, but that's another argument for another day. Fact is, most of these homemade baby foods take 15 minutes to make, and a majority of that time is just sitting around waiting for the food to cook. So why NOT make it myself? I found no reasonable explanation. When I broke it down, I realized it's actually cheaper to make baby food myself. I typically make Bradley organic food, which, yes, is more expensive. But you don't need to buy organic. For the sake of this argument I'm going to use non-organic ingredients since the jarred baby food I purchased isn't organic. A 16 oz. bag of green beans costs $2.99. This makes 16 1-oz. servings. This equals approximately $0.18 per 1-oz. serving. A 4-oz. jar of store-bought baby food from the store is on average $1.29. This equals approximately $0.32 per 1-oz. serving. So that's a savings of $0.14 per ounce! (I feel like Sandra Lee from Money Making Meals right now.) It might not sound like much, but considering how much you feed your baby, it's going to add up! As of now, Bradley eats 8-10 oz. of food a day, so that's a savings of over a dollar per day. That amount is only going to go up! Plus most baby food jars are typically around the same price, but they shouldn't be. A lot of fruits and vegetables are even less than the green beans were. Bananas, which are something like 20 cents EACH, will save you even MORE money. Cha-ching! Okay, I'm done with my rant now. That, ladies and gentlemen, is why I prefer to not give Bradley jarred baby food. I like to know exactly what's in the food I'm giving him. It might take a little more time and effort, but overall I think it's totally worth it! Now if I'm on-the-go or somehow manage to run out of food, I'm not against giving him something pre-packaged once in a while. That's fine. But overall, I'm sticking to homemade food all the way! Click here for the link to get to all my homemade baby food recipes! Let me know your thoughts/opinions in the comments section below!